Ryan's parents rented a beach house in San Diego for a week for the whole family to go and hang out. It was amazing! Literally, you could walk into the backyard and there was the beach! We had so much fun playing in the sand and the waves. I even tried boogie-boarding, believe it or not. The kids had so much fun playing with all their cousins that they didn't want to come home! It was nice to get away from all the everyday stresses like work/school, etc. and just hang out with everyone. Thanks to Papa and Lainey for inviting us to the beach house - you guys are great and we're so glad we got to spend some quality time with the fam in such an awesome place! While we were there, we got to take family pictures on the beach, which was so neat! Our kids were having meltdowns, so we were lucky to get one with everyone smiling and looking towards the camera! So now we have a better pic for the blog instead of last year's Christmas picture. Thanks to Ken's cousin for taking the pictures for us! 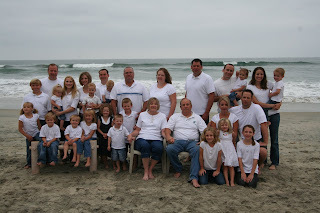 We got to take pictures as an extended family as well, which was quite crazy with about 16 little ones to corral. Since we got back things have been pretty regular, getting back into the routine and what-not. Ryan came home a couple days ago with some buckets of paint and started painting the rooms of the house! Now we have all of the downstairs painted except the office - it looks way better! Thanks, Ryan! I love the picture of your family at the beach! Sounds like a lot of fun, I haven't been to a beach in a long time! I love the picture! You really do need to change your background now. If you need help let me know. I was wondering where you have been. I love the new picture. I am glad you guys had agreat time. Ahh...jealousy! I love the beach. I just want to dig my toes into that sand! i LOVE the beach and i LOVE the pictures! SO CUTE! Glad you guys had such a fun trip. The beach is always a fun family destination!!! Cute fam pics.